Our peaceful park is situated in attractive countyside,with extensive views across farmland.towards Preseli hills, we have 25 luxury caravans holidayhomeswhich have the wales tourist 4 star graded. Bus route from Haverfordwest to Stdavids on A487 bus stop 1 mile. 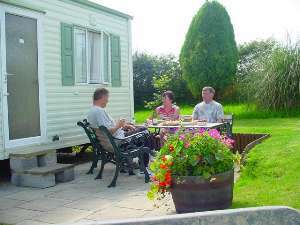 Richard & Christine White Scamford Caravan Park Keeston Haverfordwest Pembrokeshire SA62 6HN Tel: 01437 710304 Email: holidays@scamford.com Web Page www.scamford.com DISABILITY ACCESS STATEMENT The site has both static and touring pitches. All Static Caravans have two or three steps up to both doors. All Static Caravans have parking along side (on grass). The main site road is tarmac level to slightly sloping with no speed ramps. There is parking and turning area near the Laundry, information room, and rubbish bins. The Laundry and information room have 1 very small step at the door. Telephone is in an old GPO type Red telephone box. Dogs are welcome, but not allowed to run free. All mobile phone networks are available. Owners have Welcome Host training. Enquires are at bungalow, access is via a slope. Touring Pitches are on grass slight slope. Touring toilets and showers have 3 steps in to the building. Water for tourers are in two places both have parking near by and are level Waste disposal point is on level tarmac with parking near by. The town of Haverfordwest is 4.5 miles. Owners live on site and are available most of the time.